America is experiencing a great brew awakening with more cities making their mark on the emerging craft beer scene. As more and more people try their hands at the fine art of brewing IPAs, sours, stouts, pilsners, and the like, you may be wondering who does it best? So, we've compiled a list of our favorite cities to visit in search of the best frothy glass of beer. Asheville is your one-stop source for all things beer. It's the city with the most breweries per capita in America with an average of 28.1 breweries per 100,000 residents. In 1994, Oscar Wong opened Highland Brewing Company, becoming Asheville's first original craft brewery. This brewery paved the way for dozens of others opening its doors in this sleepy town, which would come to be known as "Beer City, USA." Try an award-winning beer at Wicked Weed, or head over to their sour branch, Funkatorium, for the East Coast's first sour beer-dedicated tap room. Feeling adventurous? Make a stop at Burial Beer in South Slope for some unique "death-themed" brews such as "This Golden Carriage to Oblivion" (a fruity IPA) or "Manifestation of Time" (a Vienna lager). 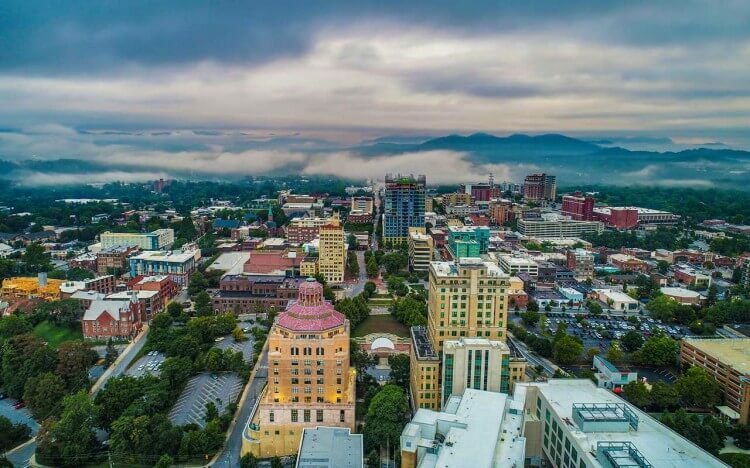 Asheville has had such an impact on the beer scene that industry players Sierra Nevada Brewing Co. of California and New Belgium Brewing of Colorado have opened up expansion breweries in the area. Home to some of the most popular and iconic domestic beers — Pabst, Schlitz, and Miller — Milwaukee has earned itself the nickname "Brew City." Pabst Brewery earned its place in history after the Great Chicago Fire in 1971. The demand among the workers rebuilding the city was so high that they couldn't pack up ice cold cases of beer fast enough as it flew off the shelves. Because of its deep history and love affair with the drink, Milwaukee is now undergoing a craft beer renaissance that rivals many major cities — for them beer brewing isn't a trend, but a way of life. Sprecher Brewing Co. kicked things off in 1985 when Randal Sprecher, a former brewing supervisor at Pabst Brewing Company, opened the first craft brewery in the city since the Prohibition era. Also be sure to check out the landmark Lakefront Brewery for innovative beers, pieces of the city's history, and family-style dining options. And what would a trip to the Brew City be without a trip to the famous Miller Park to catch a Brewers game? Come on, even its baseball team is beer themed! For great brews and great views, look no further than Billings. As Montana's largest city, this bustling town boasts the only self-guided walkable brewery tour in the state. Historic Montana Avenue is the corridor of the brewery district, with the 1.5 mile stretch hosting six breweries, a distillery, and a cidery. Montana Brewing Co. has earned itself six medals at the Great American Beer Festival since 2008 and is a must-try for beer lovers. Another warm and inviting brewery is Thirsty Street, owned by a welcoming husband and wife who brew all kinds of beers from IPAs to sours. A great part about Billings is its access to many outdoor recreation options like Yellowstone National Park. New people pass through town every day looking for a cold beer after a long hike, and the camaraderie here is incomparable. Portland sells more craft beer than anywhere in the United States, accounting for nearly 40% of beer purchases. With more than 60 breweries in town, there's no shortage of places to try. One of our favorites is Ecliptic Brewing, which was founded by Oregon craft brewing icon John Harris. The word "ecliptic" is defined as earth's yearly path around the sun and their menu reflects that with seasonal changes that rotate every 6 weeks according to the old world calendar: Samhain, Winter Solstice, Brighid, Spring Equinox, Beltaine, Summer Solstice, Lammas, and the Autumnal Equinox. Another place to try out is Breakside, which has been touted as Best Brewery in Oregon, Brewery of the Year, and has won dozens of medals for a variety of its innovative, experimental, and diverse beers. Portland is also home to North America's largest annual craft beer festival — the Oregon Brewers Festival — drawing in 85,000 beer lovers who enjoy sipping the cold beverage with a beautiful backdrop of Mount Hood. In May of 2009, the Free The Hops' Gourmet Beer Bill was signed into law in the state, which raised the limit on alcohol by volume (ABV) in beer from 6% to 13.9%. In 2011, the Brewery Modernization Act was passed, which allows breweries to sell on-premise like a brewpub. These new legislative landmarks paved the way for local craft brewers to begin opening up tap rooms that have sparked neighborhood revitalization and growth. Make a stop at Cahaba Brewing Company, which is known for its locally sourced ingredients and giving back to local charities. Every Wednesday, Cahaba partners with a non-profit organization at its taproom to help benefit a good cause. As the oldest and largest brewery in Alabama, Good People Brewing is known for its humble but delicious beers like the Coffee Oatmeal Stout and Mumbai Rye IPA. This brewery believes that coming to its tap room is about spending time with friends and family while enjoying beers together around the table. The Birmingham beer scene is all about good and southern hospitality and a must-try if you're in the area. Portland — the one on the east coast — is a small city with just 66,000 residents, but boy do they love their beer! While Portland is home to a larger brewery, Allagash Brewing Company, there are many smaller brewers who are able to hold their own. Bissell Brothers opened in 2013 and now has the largest taproom in Maine (but still be prepared to wait in line). Bissel's Substance Ale can be found on tap throughout Maine. If you want a quick way to try a bunch of different breweries, book a tour on the Maine Brew Bus for an afternoon of sips and enthusiastic brewers waiting to tell you their stories. The microbrew scene in the Mile High City is buzzing with more than 70 breweries in the city and surrounding environs. Coors, the largest brewing facility in the U.S., is located just outside of the city in Golden, Colorado. Coors, which started brewing its beer with Rocky Mountain spring water in 1973, helped launch the city's love for beer. For a city institution, try one of the beers at Wynkoop Brewing Co., which lies in the heart of LoDo (Lower Downtown) and is surrounded by landmarks such as Coors Field and Union Station. Wynkoop is known for its innovative beers which are brewed with everything from gummy bears to green chilies. Another one of Denver's iconic breweries is Great Divide, whose expansive and revolving tap selection impresses locals and beer connoisseurs alike. Finally, for a true beer lover, you won't want to miss the annual Great American Beer Festival, held each fall for more than 30 years. According to the Guinness Book of World Records, this festival is where you'll find more beers on tap than anywhere else in the world.